The 47.24 metre motor yacht Abbracci has been sold with Barbara Stork Landeweer and Michael Rafferty at IYC and Jim McConville at Allied Marine introducing the buyer. 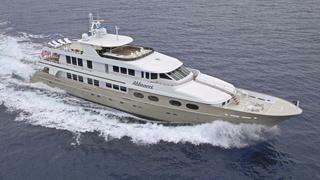 She was built to ABS class by Christensen in 1997 with an exterior styled by Glade Johnson and Donald Starkey. In 2012, she was stripped back to the hull and comprehensively refitted over a period of 18 months. The refit involved an update to the bridge deck that enlarged the aft deck and created a spacious boat deck saloon. All the mechanical systems were serviced, installing a new power conversion system, air conditioning system, electrical control panels, water heaters and water makers. Deadening mat was also installed under flooring to quieten Abbracci. Her engines were overhauled, and she now features twin Deutz 2,200hp engines that give her a cruising speed of 16 knots, a range of 3,500 nautical miles at ten knots and she is fitted with Naiad zero speed stabilisers. All the interior furnishings were upgraded and the interior modernised. Her Glade Johnson-designed interior sleeps up to 11 guests in a master suite — which was updated to offer his and hers bathrooms — as well as four double staterooms and a single cabin, all of which are en suite.